Founder of Manto de Gracia Christian School in Nueva Guinea, RAAS, Nicaragua (2010). He previously served on the pastoral staff of Grace Outreach Center, Plano Tx from 1997-2010, as a missionary in Managua, Nicaragua from 1991-1997, and has experience in both the private and public sectors in the USA. Co-founder of Manto de Gracia Christian school. Se previously served as the women's ministry director of Spanish speaking congregation of Grace Outreach Center (1997-2010). Has been a registered X-ray technologist in Texas since 1975 and most recently was employed by PrimaCare Urgent Care Centers of Dallas. 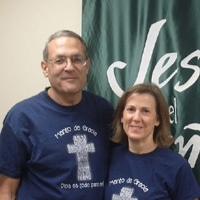 NACE's founding missionaries, Bob and Barbara Kelly, have a history in Nicaragua. During their time in Managua (1991-1997), they worked in many areas: helping establish an orphanage, running a pastor's Bible training center, founding a church, teaching Bible in Christian schools and even two full years of teaching Bible in 2 different public schools. ing in the USA from 1997-2010, they continued activities in Nicaragua by supporting missionaries and projects and taking short term missions groups. In June, 2007, they partnered with Dr David Abebefe and Zoya MInistries to facilitate a medical clinic in Nueva Guinea. It was at this time that God birthed the desire to build a school as a tool for spreading the gospel of Jesus.